Javier Goya y Bayeu (1828);Mariano Goya y Goicoechea (1854); Federico de Madrazo and/or Román Garreta y Huerta (c. 1855-1860); Paul Lebas (sale, Paris, Hôtel Drouot, 3 April 1877, no. 72); purchased by Baron Etienne Martin de Beurnonville (sale, Paris, Hôtel Drouot, 16-19 February 1885, no. 51, to Philippe); private collection, Paris; Alfred Strölin, Lausanne, by September 1933; purchased by Ian Woodner, New York, 21 July 1983; by inheritance to his daughters, Andrea and Dian Woodner, New York, 1990; gift to NGA, 1991. Goya dans les collections Suisse, Fondation Pierre Gianalda, Martigny, 1982. nos. 13 (recto) and 14 (verso). Goya: The Condesa de Chinchón and Other Paintings, Drawings, and Prints from Spanish amd American Private Collections and the National Gallery of Art, National Gallery of Art, Washington, D.C., 1986-87, (recto only) (unpaginated brochure). Master Drawings: The Woodner Collection, Royal Academy of Arts, London, 1987, no. 106. Goya and the Spirit of Enlightenment, Museo del Prado, Madrid and tour, 1988-89, no. 58 (recto only) (Madrid only). Master Drawings from the Woodner Collection, Metropolitan Museum of Art, New York, 1990, no. 140. Dürer to Diebenkorn: Recent Acquisitions of Art on Paper, National Gallery of Art, Washington, D.C., 1992, no. 45 (recto only). Goya. La Década de Los Caprichos: Dibujos y aquafuertes, Real Academia de Bellas Artes de San Fernando, Madrid, 1992, no. 59 (verso only). The Touch of the Artist: Master Drawings from the Woodner Collections, National Gallery of Art, Washington, 1995-1996, no. 98. 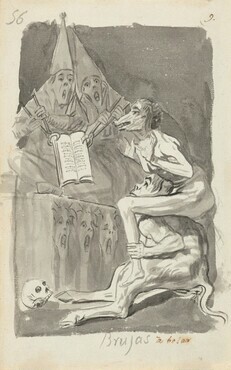 El Libro de los Caprichos: Francisco de Goya, Museo Nacional del Prado, Madrid, 1999, no. 70 (verso only). Goya, Drawings from His Private Albums, Hayward Gallery, London, 2001, no. 19, 98. Goya: Images of Women, National Gallery of Art, Washington, 2002, no. 78. Master Drawings from the Woodner Collections, National Gallery of Art, Washington, D.C., 2006 - 2007. Gassier, Pierre. 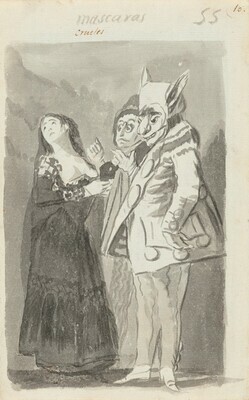 "Les dessins de Goya au Musée du Louvre," La Revue des Arts 1 (1954): 32. Gassier, Pierre and Juliet Wilson. Goya: His Life and Work. London, 1971: no. 415 and 416. Gassier, Pierre. "Une source inédite de dessins de Goya en France au XIXe siècle." Extrait de la Gazette des Beaux-Arts. (1972): 114, no. 72. Gassier, Pierre. The Drawings of Goya: The Complete Albums. London, 1973: no. B.55(60) and 56(61). Heckes, Frank I. and Cathy Leahy. Reason and Folly: The Prints of Francisco Goya. Victoria, 1998: 30, fig. 26. Blas, Javier, José Manuel Matilla, and José Miguel Madrano. El Libro de los Caprichos. Franciso de Goya. Madrid, 1999: 352 (verso). Goya: Images of Women. Exh. cat. Museo Nacional del Prado, Madrid; National Gallery of Art, Washington, 2001-2002: no. 78.